Ready to start a new Halloween tradition? I have just the thing to help you! I received the most adorable set called Switchcrafted: The Story of the Switch Witches of Halloween for review. 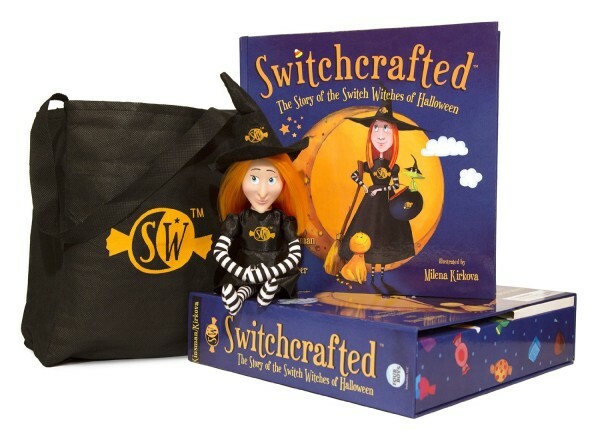 It comes with a book, a treat bag and the cutest little witch you ever did see! So here’s the deal: Witches need candy to survive! It helps them fly, heats up their bath water and fuels their magic. The problem is, they never quite blend in right on Halloween, so they can’t go trick-or-treating for it themselves! They need the help of all the good little boys and girls out there: emphasis on GOOD. See, like the big red man in the North Pole, the Switch Witches also keep track of who has been good and who has been, well, not so good. They do this with the help of the little witch included in the box. Think Elf on a Shelf, but for Halloween. Every Halloween, they ask the good kids to put their candy in a bag and leave it out. Then the witches come down the chimney (or find other ways inside) and swap out the candy for a toy! Of course, kids can keep some of their candy if they want. This is such a cute way to limit sweets without ruining the fun of Trick-or-Treating. Kids will know they’re helping the witches! I personally love it because it presents witches in a sweet, fun way. As a Pagan (and yes, a witch), I was really sad when my son went through a phase where he was terrified of witches. The witches are all super sweet and really want to help keep kids healthy and good, while also helping themselves of course. Even if you’re not personally a witch, it’s still just so much fun! The other fabulous thing about Switchcrafted: it helps promote reading and family bonding time. The book is filled with gorgeous and vividly colored illustrations, created by Milena Kirkova. The story is simple yet fun, appealing to children as young as preschoolers to older kids in grade school. After reading the story, talk about healthy habits with your kids and encourage them to give up some of their candy loot to help the witches’ cause. 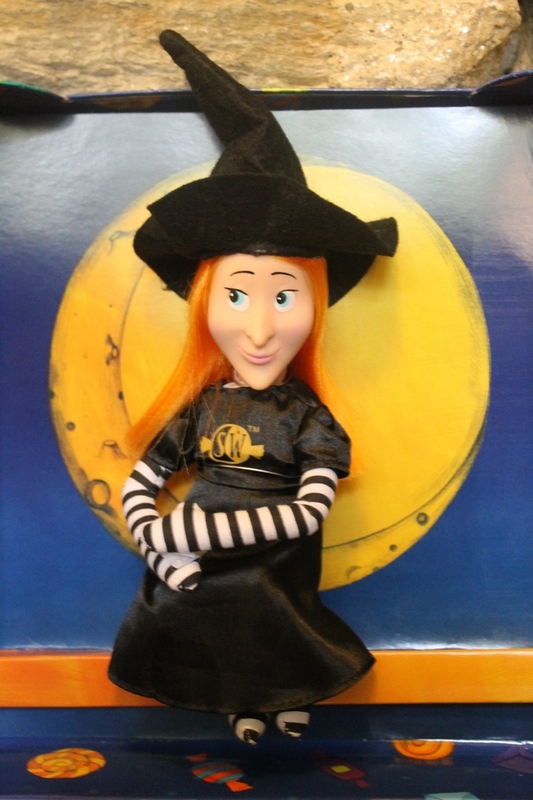 You can also get creative with the cute little witch. For example, since we’re trying to encourage healthy living, have her sitting on your child’s bike or scooter with a note about how proud she is that your child is getting active. Or hide her among the video games with a note encouraging kids to go outside! You can find more great ideas, as well as info about the story at Switchcrafted.com. There, you can also register your witch, download free coloring pages and more. What are your favorite family Halloween traditions? Share them in the comments! Each Halloween since Hurricane Katrina, we’ve gone to my cousin’s neighborhood which is filled with young children. Most of the families do special games and treats, and one neighbor turns the exterior wall of his home into a movie theater. It’s a great place to stop and watch Halloween cartoons for a few minutes while the kids rest and have popcorn and juice. The last year, there was even a jumpee, so it’s definitely getting bigger and better. My two girls love it and look forward to the tradition of trick-or-treating with all their cousins. Thanks for this chance to win such a neat prize! That is such a cool way to celebrate Halloween! We go to church for games and fun for the kids. Carving pumpkins and trick-or-treating as a family! We have a fall harvest party where we do hay rides, dress up, bob for apples, etc. It’s my favorite Halloween tradition. We have a haunted hayride we go on every year at a local campground, love it!. I enjoy watching my grandkids trick or treat too. I enjoy watching the neighborhood kids trick or treat and I dress up to give out candy. We like going to our church’s Fall Festival that’s always on Halloween after about 30 minutes of trick or treating! We have a Halloween party every year. It’s so much fun to see what everyone is dressed as. Our Favorite Halloween trdition is decorating the yard SpookY! We love it! I would always have a halloween themed dinner,halloweenies other spooky entree’s and then we trick or treat at all the relatives houses first then all over the place until they are too tired,then when they get back to warm up we watch a new halloween movie,while I still hand out candy to trick or treaters,it changes sometimes the menu,the order of things but basically the tradition lives on. Now that my son is grown and on his own, my husband and I look forward to passing out candy to the kids in the neighborhood. My favorite Halloween tradition is decorating the house with the whole family. Dressing up and going out with friends on Halloween is always fun! Our Halloween tradition is to make sure we leave extra bird food out using the mini pumpkins that have been cleaned and hollowed out. We love carving the pumpkins! Every Halloween since I was a little kid my family always had chili dogs for dinner on Halloween – it’s become a tradition in my own family now too! My other favorite Halloween tradition is keeping a tally of how many trick or treaters we get each year. I don’t know why but I love it! That is a great tradition! I have a friend who does chili dogs for Halloween too. Keeping track of trick or treaters would be easy for me. I live in the back of my development. I get one. LOL. Going to my boys’ school Halloween carnival is our tradition. My favorite tradition is when we go to the pumpkin patch together and pick out a pumpkin for each of us to decorate at home. My favorite tradition is going to the pumpkin patch and getting pumpkin. My favorite tradition is making Carmel Apples with the family!! My favorite tradition is decorating the front window with cute window clings, lights, and pumpkins.